The more post-modern version is Scharmer’s U Process for collective transformation and prototyping. The smaller day to day or moment to moment encounter with transformation, like changing a destructive habit, overcoming fear or shadow work either go unobserved or are subject to a myriad of self-help books. Whatever the scale is, the archetypal movement remains that of a dive into interiority, the ‘small death’ (or micro-dis-identification) and the resurfacing with a different perspective. This process can take minutes, days, months, or a lifetime, and is iterative. A typical transformational process needs basic prerequisites in order to succeed. External factors include a safe space, a method/injunction to follow, a coach or mentor, or rules. Interior conditions (interior to the person) include a willingness to re-own previously resisted or dis-associated shadow parts. It may also require the capacity to access, if just for a very short period of time, different states of consciousness. Scharmer (2009) describes the respective stations “open mind”, “open heart” and “open will”, indicating the willingness to suspend judgement, becoming vulnerable and authentic, and most of all, present. He describes this movement down the U as going from gross to subtle, and the combination of sensing and being present -“precensing”- at the bottom at the U as causal. In reality, the access to these different states of consciousness is not that clear cut and often fuzzy. The process of accessing subtle or even causal states can follow various patterns, primarily cycling between the work of shadow parts and resistances being integrated and sensations of relief along the descending arm of the U. The quality of that access and subsequently of the depth, width and nature of transformation depends on many factors, such as the altitude, meaning making system and personal integrity of the person(s) undergoing the process and on the effectiveness of the tools and methods applied. 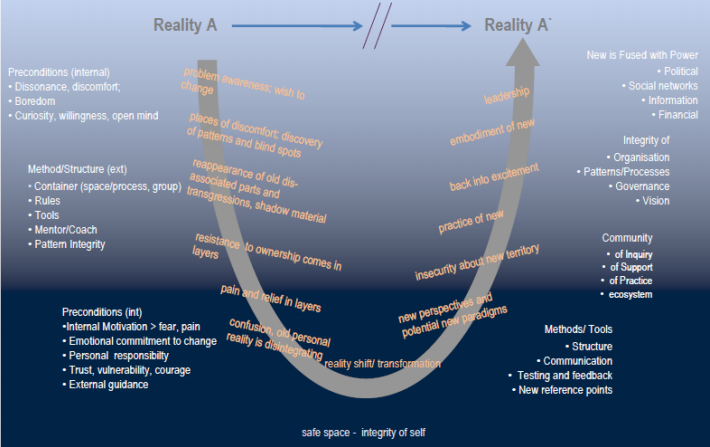 The following diagram uses the U shape to map out some of the typical stages of a transformative process, along with the internal and external conditions that would foster a deep and successful shift in personal reality, individual or collective. In the next paper, the lateral movements and escape mechanisms that occur along the different stations will be discussed, along with the tools that could successfully counterbalance them. “We’ve come to believe that the core capacity needed for accessing the field of the future is presence. We first thought of presence as being fully conscious and aware in the present moment. Then we began to appreciate presence as deep listening, of being open beyond one’s preconceptions and historical ways of making sense. We came to see the importance of letting go of old identities and the need to control and, as Salk said, making choices to serve the evolution of life. Ultimately, we came to see all these aspects of presence as leading to a state of “letting come,”of consciously participating in a larger field for change. When this happens, the field shifts, and the forces shaping a situation can shift from re-creating the past to manifesting or realizing an emerging future.” Peter Senge. This is great stuff, well-written. I will be sharing it for sure. This is a dense well thought out article. These shifts that the authors talk about are important in personal transformation. In organizational work, the downstream effects are exponential.